Community detection is an important graph (network) analysis kernel used for discovering functional units and organization of a graph. Louvain method is an efficient algorithm for discovering communities. However, sequential Louvain method does not scale to the emerging large-scale network data. Parallel algorithms designed for modern high performance computing platforms are necessary to process such network big data. Although there are several shared memory based parallel algorithms for Louvain method, those do not scale to a large number of cores and to large networks. 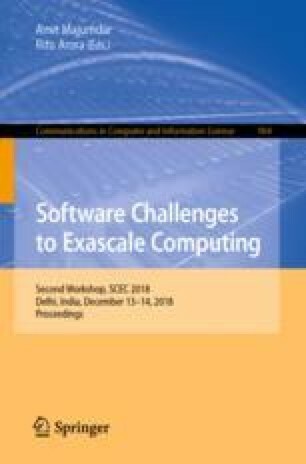 One existing Message Passing Interface (MPI) based distributed memory parallel implementation of Louvain algorithm has shown scalability to only 16 processors. In this work, first, we design a shared memory based algorithm using Open MultiProcessing (OpenMP), which shows a 4-fold speedup but is only limited to the physical cores available to our system. Our second algorithm is an MPI-based distributed memory parallel algorithm that scales to a moderate number of processors. We then implement a hybrid algorithm combining the merits from both shared and distributed memory-based approaches. Finally, we incorporate a parallel load balancing scheme, which leads to our final algorithm DPLAL (Distributed Parallel Louvain Algorithm with Load-balancing). DPLAL overcomes the performance bottleneck of the previous algorithms with improved load balancing. We present a comparative analysis of these parallel implementations of Louvain methods using several large real-world networks. DPLAL shows around 12-fold speedup and scales to a larger number of processors. This work has been partially supported by Louisiana Board of Regents RCS Grant LEQSF(2017-20)-RDA- 25 and University of New Orleans ORSP Award CON000000002410. We also thank the anonymous reviewers for the helpful comments and suggestions to improve this paper.